A funny thing happened to me when I picked up Jane Green’s latest novel, Falling. As with many thick and juicy books (just how I like them! ), I thought it would last me for a good few days at least. I settled in with it on a Sunday morning over breakfast, figuring I’d get in a chapter or two before I got into the meat of my day, and before I knew it, it was noon. Then two. Then five thirty. Then seven. The laundry didn’t get done. Neither did the vacuuming (shucks). If it weren’t for my four-legged reading partner needing to go for his walks and eat every so often, I might not have moved all day. Since I did have to move, I managed to whip up some sugar cookies. It was the only other thing I managed. Priorities. Bottom line: Falling consumed my entire Sunday, and I wouldn’t have had it any other way. Falling introduces us to Emma Montague, who years ago fled her upper-crust life in England for a high-powered job in New York finance—until the day she realized it wasn’t what she wanted. Trading in her cutthroat career and uncomfortable shoes for a cozy cottage and a fresh start in Connecticut, Emma is ready to begin anew in a town where she knows no one except for her longtime best friend. As she uncovers the potential in her quaint fixer-upper, she also uncovers a potential soul mate in her landlord, Dominic. A handyman-slash-bartender and single dad to a six-year-old son, Dominic is nothing like the slick Manhattanites she’s used to dating—not that she’s looking to date anyone right now. Navigating the road from friendship to much, much more, Emma allows herself to fall in love with a new life and new relationships she never envisioned for herself—until an unexpected turn of fate changes the course of her life once more. Despite the romance at the forefront, the real star of Falling is family—the families we’re born into and the families we build for ourselves—and Emma and the people in her life who come together to form that web are what make this book a true gem. Jane Green has a knack at creating characters I instantly want to know, and as I spent hour after hour cozied up on the couch with them, they became more and more a part of me. From Emma’s high-society English parents to Dominic’s oh-so-lovable six-year-old son, the people who filled up the pages made it impossible for me to put the book down. The slice-of-life scenes made me feel like I was living right in Emma’s cottage with her, and I became as familiar with Dominic’s crooked bookshelves and backyard barbeques as she was. 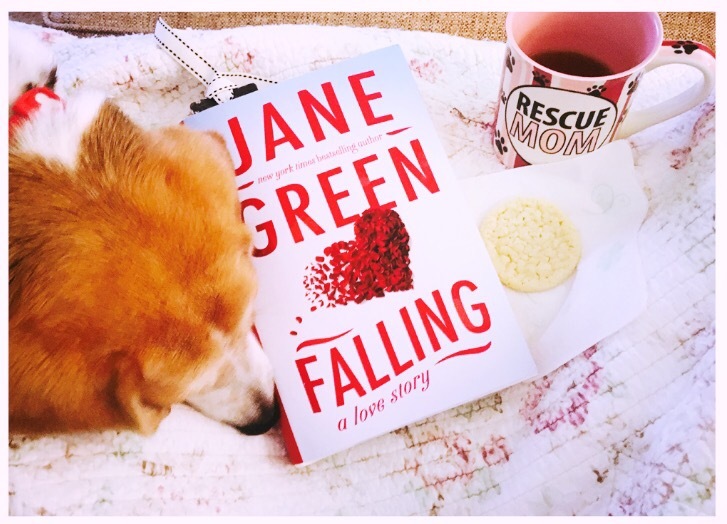 I have been a fan of Jane Green since her earliest books (Mr. Maybe being my personal favorite), and with Falling, her 18th novel, she proves that she’s only getting better with time. Falling is love story in every sense of the word. It’s a novel about falling in love, about familial love, about loving the life you lead, about the love between friends, and about loving yourself enough to get through even the hardest of times. It’s exactly the kind of novel you can lose yourself in, and the kind of novel you’ll continue thinking about long after you’ve slid it back onto your (hopefully non-crooked) shelf.